Well, the holidays are behind us and we are now in a new year. Goodbye, 2016! Now it's time for some winter's respite and recovery. Hope you all had a wonderful holiday season and I wish you much health and prosperity this new year! 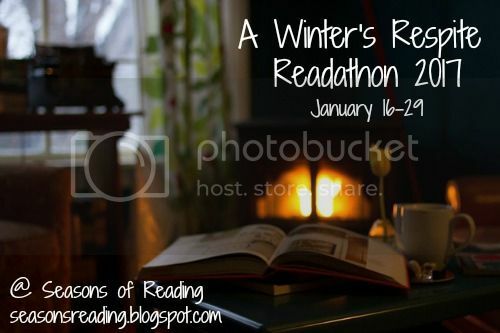 This is the official sign up for A Winter's Respite Readathon! Dates are January 16 - 29, starting at 12:00am Monday the 16th, and ending at 11:59pm on Sunday the 29th. Times are central standard time so adjust your times accordingly. Yes, the readathon is now two weeks long! I, for one, am pretty excited about that! Of course, like most readathons, the books read must be novels or novellas, adult or young adult are fine, and you can read children's books too (as long as you do read some novels too). Note: Non-Fiction is also okay! You DO NOT have to participate the entire two weeks. Join in when you can, start in the middle, end early...whatever works best for your schedule. As with all of my readathons, it will be a time for relaxed reading during which we can personally challenge ourselves and whittle away our ever looming TBR piles/shelves/libraries. Guidelines for the readathon can be found HERE or you can access in the tab at the top of the blog. Any information you need about the readathon can be found there. Please do be sure to check the guidelines to make sure you're following along correctly. There are specific rules regarding signing up and wrapping up, especially in regards to the giveaway. Also, regarding the giveaway, I'll be again adding a Google form to capture names and email addresses so if you're interested in winning a prize (and you've met the sign up and wrap up criteria), I will ask you to fill in that form which will be located on the prize page. I will not be hosting any mini-challenges. However, if anyone else would like to host a mini-challenge or giveaway, you are more than welcome. I am also looking for prize donations so if anyone would like to contribute, let me know. Authors, this is a great way to promote your book! (Contact me using the contact form above). Our hashtag is #WintersRespite Also, don't forget about our Facebook group. You can access via the tab at the top of the blog. Sign up in the linky below. You do not have to do a post now, unless you want to help spread the word (much appreciated). If you don't have a blog, use Facebook, Twitter, Goodreads, Instagram... Having a blog is not required. Be sure to grab the button at the top of this post (there's also a grab code below the button in the sidebar). I will of course take part Michelle. My post is there but it is not completly updated, I will do that later when I get to my computer. Happy New Year...Thanks for hosting. All signed up, with goals too! I like the two week run of this one! Always some books I save for this time of year, the indoor days, with or without snow! Thanks, Michelle! Gladly would share our extreme snow load if you'd like to have some snowbanks your way, Lucy ! I'd love to take part. I like that it will be two weeks because I have a super busy schedule this month. I just posted my signup on my blog. Now I just need to figure out when it starts here in VA. Anticipating... thanks for hosting, Michelle, and HapPy New Year of Reading to All ! Not sure why I can't find a wrapup post for the Christmas Spirit Challenge, but would add mine if you have one . I'm running behind, Sharon, but will have the wrap-up post over at Christmas Spirit by tomorrow. Sorry for the delay! Sounds like fun! I need to get through my TBR pile, but not sure how many I will get through. Maybe only a couple or maybe 3 in two weeks. But if I don't try, I won't know! And being a horror writer, and reader, this works perfectly for me! This is my first read-a-thon that I am doing so I am super excited! I'm in. Looking forward to it. Thanks! The link to my goal post because I am smart and forgot to include it in my other links. Thank you! I will look forward for it. It sounds fun. I'm so excited to be taking part of this readathon. I took part last year and it was a blast. This was my first ever readathon and I'm so happy to be able to do it again!! A #WintersRespite #Readathon - It's a wrap!